The recently formed Shirley Davis & the Silverbacks consists of an Australian born soul singer and the resident house band at Tucxone Records, a soul label based in Madrid, Spain. The combination of these two forces is pretty unstoppable on Black Rose, their first full length project. Recorded in under a month’s time, the album is a mix of funk and soul, hearkening back to the 1960s. In fact, their band leader, Edu Martinez, describes the band as working similarly to the classic soul labels of the ‘60s. Before joining the Silverbacks, Shirley Davis was featured in prominent Australian groups Deep Street Soul and Grand Wazoo. She also collaborated with Japanese funk band Osaka Monorail and the late Marva Whitney. Her voice draws an obvious comparison to the late great Sharon Jones, but is also reminiscent of Gladys Knight at times, Macy Gray at others. Davis’s voice has a versatility and an individuality all its own, though, which shines throughout the album. The groove established in the opening title track, “Black Rose,” continues throughout the album, but never becomes repetitive. One of the best arrangements comes in the final track, “Make My Day,” which makes excellent use of organ. “Pay for Your Love” is another highlight, a slowed down song with Davis utilizing more of her range than she does on other parts of the album. There is one instrumental track on the album, “Burial of a Dead Star.” Surprisingly, though, it was not a standout arrangement compared to the other songs. Overall, Shirley Davis & the Silverbacks are an impressive combination, and Black Rose is a solid first project. 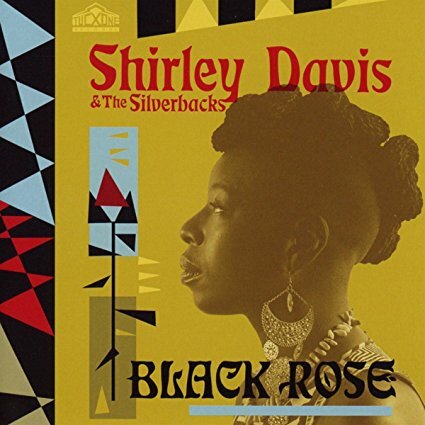 This entry was posted in Rhythm & Blues, Soul, Funk and tagged Allie Martin, Black Rose, funk, Shirley Davis and the Silverbacks, Shirley Davis and the Silverbacks - Black Rose review, Soul by aaamc. Bookmark the permalink.